I as at a resale shop Tuesday and came across two pieces that were priced very cheap. One was a small dish/bowl and the other was a cradle. The bowl is a #463. The cradle I'm not sure about. It looks like it could be for Pyrex and that's about all I know. It's oval in shape and measures 14 1/4" inside to inside the long way and 9 3/8" the narrow way. I have since cleaned it up with my Autosol metal polish and it looks a 100% better than when I bought it. 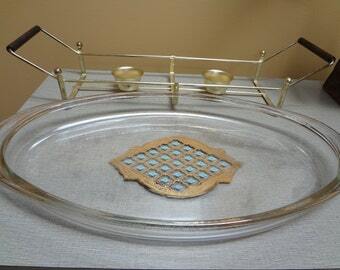 Michael, based on the dimensions I am guessing it might be a cradle for a serving platter kind of like this one. I'm just guessing though, if it's for a Pyrex dish I am sure Doug will have more info about that. I thought first of the Georges Briard platters when I saw it. Thanks Bonnie. I ordered a Pyrex collectors guide book last week through this site and looking thru it I didn't see that particular cradle. The first piece I bought and posted here (divided dish) practically falls through the cradle in question so it's definitely made for something much bigger. It may be the Pyrex meat platter also. If I can find mine I will measure the base to see if it would fit. 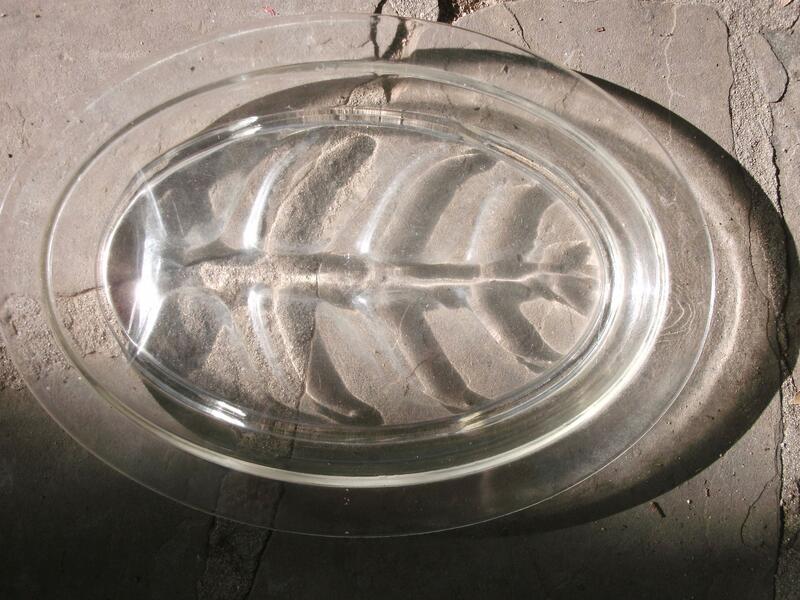 I see the Georges Briard platter that Doug posted here is 18 x 10 so I guess it is too big. Or maybe not, depending on the dimensions of the base of the platter and how it sits in the cradle it might be the right one??? I may have just answered my own query regarding that cradle. I was comparing how the cradle attaches to the wood handle on my piece as to how it attaches to the handles on our home page pics. My cradle has the wire going into the wood about 3/4" from the end of the handle where as the ones I see on our home page here have them attached directly into the end of the wood handles. 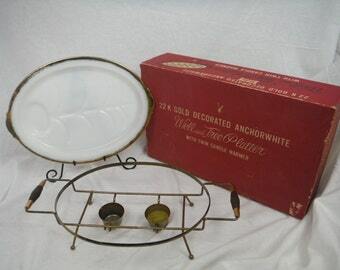 So I now assume that cradle is perhaps for a piece of Fire King or Corning Ware, who knows maybe it's an oddball piece? I found a Fire King meat platter with a cradle but the handles are different. Here is a picture of my meat platter. It may very well work for this one.